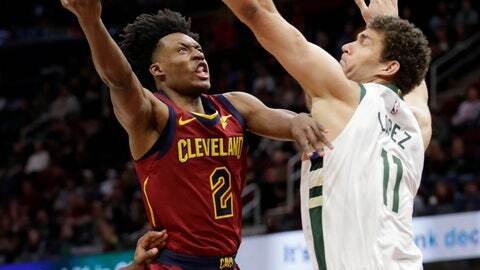 CLEVELAND (AP) — Collin Sexton has left a sluggish, sometimes painful start to his pro career, behind him. He’s taking off, and he might just take the Cavaliers with him. Sexton’s development has been one of the bright spots for the Cavs, who have undergone a coaching change and been riddled with injuries. His seven-game scoring streak is the longest for any rookie since Tim Duncan did it 21 years ago. Khris Middleton scored 26 points and Eric Bledsoe 24 for the Bucks, who couldn’t wrap up their first division title since 2001. They were at a disadvantage as Antetokounmpo sat in warmups and watched from the end of Milwaukee’s bench. Cleveland’s Kevin Love, who missed Monday’s game in Detroit with a sore back, left in the third quarter with an apparent head injury. He banged into Bledsoe late in the second quarter and played just three minutes in the third before going to the locker room for evaluation. “He didn’t seem to be himself,” coach Larry Drew said. While the Bucks are nursing injuries, the Cavs were as close to full strength as they’ve been in months as Tristan Thompson returned after missing 26 games with a sore left foot. It was a rare chance for Drew to have three of his top frontcourt players in Thompson, Love and Larry Nance Jr., who had missed the previous five games with a chest bruise. “It felt good having that many bodies,” Drew said. Middleton did all he could to carry the Bucks in the first half by scoring 18. But without enough support, he couldn’t keep up with the better-balanced Cavs, who built a 16-point lead and went into the locker room at halftime leading by 11. Budenholzer dismissed a report that Mirotic, who got hurt during Tuesday’s win over the Lakers, could be out for as long as a month. The Bucks did not provide a timeline in their release. Since March 11, the Cavs have beaten Toronto, Detroit and Milwaukee — three probable playoff teams and in the Raptors and Bucks, the two top teams record-wise in the league. Budenholzer and Bledsoe were given technicals for arguing during the break between the first and second quarters. … Antetokounmpo scored 44 with 14 rebounds in Milwaukee’s win at Cleveland on Dec. 14. … Dropped to 13-2 in the Central. Cavaliers: Nance finished with seven points, a team-high five assists, two steals and two blocks. … Although having Thompson on the floor would have certainly helped them win some games, Drew said the Cavs didn’t push Thompson. “I was hoping we would have gotten him back sooner,” Drew said. “But any time you are dealing with an injury, you can’t rush players back. ” … G Matthew Dellavedova missed his seventh straight game with a concussion.